Organic Music have embarked on a collaborative re-issue program with Japan`s HMV record shops. Going by the name of “JAPANISM”, the aim of the venture is to release obscure Japanese music on vinyl. The first title will be an AA-sided 7” from Colored Music, an experimental, early `80s line-up featuring respected multi-instrumentalists Ichiko Hashimoto and Atsuo Fujimoto, with Pecker on percussion. Musically, the two tracks on the 7” (edited by Organic`s Chee Shimizu from the group`s sole LP) are Fusion, with a spiritual edge. Listening I was thinking, “The Rhythm Of Life” X2: Mike Lundy`s and even more so, James Mason`s. In fact, both sides hold up to comparison with Mason`s “Dance Of Life / Up Jump” from last year. 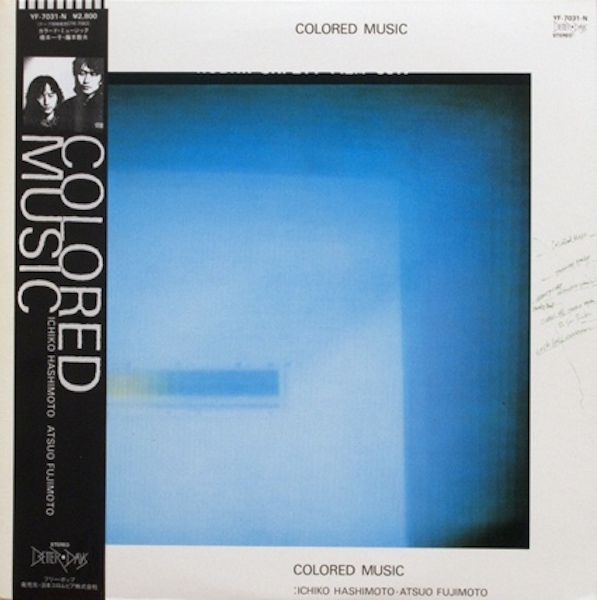 “Colored Music” being the ensemble Jazz of “Dance”, with male and female choruses, a slap bass that lends it a Post-Punk edge, and solos transformed by synthesizer a la Eno working the knobs for Roxy. “Heartbeat” is the Proto-House / Proto-Techno of “Jump”. Drum machines and analogue bell-like sonority. Testpattern meeting Kylyn (Hashimoto and Fujimoto worked with Kylyn`s Kazumi Watanabe, amongst many others) with a break that has YMO`s space invaders destroy a piano. When I asked for more background information on the artists involved Chee sent over a load of links to personal highlights from Ichiko Hashimoto`s catalogue. Links to impossible to find gems that combine ambience, Dip In The Pool Art Pop, Bossa Nova, Classical keys and operatic vocals. All of it new to me. I`m now hoping that this was a big hint and that these works are part of JAPANISM`s schedule. Whatever`s next we can be sure it`ll be just as special. You can pre-order directly from Organic here. Please note that the Youtube clips are the original LP versions, and not Chee`s edits.